Monitoring criminal hotspots, where graffiti, drug transactions, and dumping are taking place is a common need of municipalities. However, this can be challenging as criminals often target areas where lighting is poor, and infrastructure may not exist. One offering, the Q-Star FlashCam, is gaining traction, with multiple news releases highlighting its use. While the FlashCam does solve the issue of infrastructure, however, it presents an additional set of critical drawbacks. In this note, we look at these issues, compare to other solutions, and provide our recommendations for alternative solutions. Digital still camera: A 12 megapixel digital still camera (essentially a consumer point-and-shoot) is used for image capture, with a 2 GB SD memory card. Users may select 1-4 images per activation, but no full-motion video is provided. A high-powered flash is included, built into the front face of the enclosure. Motion detector: A PIR motion detector with specified 100' range is built into the front of the housing, which is used to trigger the camera and other functions. Digital audio player: Users may record a voice message, up to 14 seconds in length, to inform subjects that the site is under surveillance. 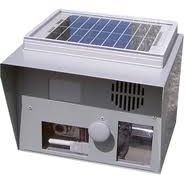 Solar panel and battery backup: The FlashCam uses a top-mounted solar panel to recharge its internal 7AH battery. According to Q-Star, two hours of sun per day are all that is needed to keep the battery charged and able handle about 40 activations per night. Two models of FlashCam are available, the 880k and 770k. Both models share all of the above features, though the 880k features wireless (Wi-Fi only) download capability, where users of the 770k must retrieve files from the camera itself. Dummy cameras are also available, using the same enclosure as the FlashCam, without any electronics. Q-Star recommends users move the real FlashCam to another area once incidents have stopped at the current location, and put a dummy camera in its place to deter further occurances. Pricing for the FlashCam ranges from just over $5,000 for the 770k to $6,000 for the 880k via the GSA schedule. With municipalities being a target market for Q-Star, and likely their biggest vertical market, we expect the GSA schedule is used often. The main advantage of the FlashCam is that it requires no infrastructure to run. Users mount the camera in the desired location, which requires no power or network connectivity. This saves the expense of installing power and data at each location. Depending upon the location, installing AC power may run well into the thousands of dollars. Additionally, the camera's 12MP resolution is far greater than the great majority of IP HD cameras, which theoretically could provide more usable image captures at greater ranges. Perception of high resolution: On paper, the FlashCam's 12MP resolution sounds very high. However, given the motion detector's 100' activation range, and Q-Star's own specification of an 82' FOV at this 100' range, pixel density is still not in the identification range. A 12MP image has a horizontal resolution of 4000 pixels, which results in 48 PPF at 100'. Q-Star's marketing claims that the camera can capture a license plate at 250' are also pointless, as this is well beyond the motion detector's specified range, so capture would never be triggered. Purely reactive monitoring: The FlashCam is only able to be used reactively, as it does not allow for real-time monitoring or alerts. This means that only post-event still images are collected, and authories may not be dispatched to interrupt subjects before damage is done. Still images only: While the FlashCam can store up the four images per activation, these images are triggered only by the event, with no pre- or post-recording. This could result in an incomplete picture of the event, as actions prior to it are missed. Inability to arm/disarm: The FlashCam is unable to discriminate between friend and foe, and it may not be disarmed, essentially meaning it's always on. This means it can only be used in areas where no activity should be occuring, or unwanted activations will be rampant. This will be annoying or aggravating to subjects who are authorized to be in the area (as evidenced in one recent report from the UK), and result in useless images being captured, which then need to be sifted through manually, slowing investigation of actual incidents. We believe the key challenge for the FlashCam is the assumption that post-event still images will be sufficient for investigation and prosecution. With even high-resolution still photos in hand, authorities have little to go on in order to investigate a subject's identity, aside from posting these images, asking for the community's help in locating him or her. Even if a suspect can be found, we suspect many of these cameras are viewing too large an area to be used for evidentiary images. For users seeking to add surveillance to areas where graffiti, dumping, or vandalism are an issue, but infrastructure may not exist, users are better off turning to system which offer real-time alerting capability, so that acts may be interrupted and criminals apprehended. Additionally, review of these alerts by a human operator greatly reduces the number of nuisance alarms generated. Authorized users may also be distinguished from unauthorized. Videofied: Though it lacks the resolution of the FlashCam, Videofied may be a practical alternative in many applications. It is wireless and battery powered, requiring no infrastructure, and capable of transmitting video cliips immediately upon activation via cellular connection. Despite its low resolution (320x240), for the cost of a single FlashCam, likely 6-7 Videofied MotionViewers ($600 USD MSRP, plus ~$700 for a control panel) may be installed, able to be located at chokepoints where suspects may enter an exit an area. A single view of the wider area is not possible, however. Videofied also lacks voice notification, though alarm sirens are available, or it may be added via an external voice announcer and triggered via relay. VideoIQ: VideoIQ's iCVR-HD (~$2000 online) has a detection range of about 550' across a 350' field of view, according to VideoIQ's technical documentation. This coverage area is much larger than the FlashCam. However, the iCVR-HD requires light in order for its analytics to perform, which is not required by the FlashCam. External IR illumination may be required, increasing cost. It also requires power, and an external cellular connection to deliver real-time alerts. VideoIQ has an additional advantage over the FlashCam or Videofied, in that an operator may speak directly to subjects on site, via an external speaker, to tell them to leave the area. This is likely more effective than a voice recording, as subjects recognize it as a real person. Like Videofied, the iCVR-HD is priced well below the FlashCam, leaving $3,000-4,000 for external IR illuminators, cellular routers, voice announcers, or even solar power systems.